yes it's good and cheap but I don't think it would suit emphatic people who need a "full of human warmth" environment. Do you have many human beings in front of you in banks in Calais or do you often deal with computers? Do you prefer a human-faced robor or a screeny-faced comp? Gérard I agree that some people behave like unfeeling and soulless robots (I don't know if that word exist) but thanks to education everyone can improve and become more human. The power of love works wonders and robots are deprived of it. Love is a substance you can't manufacture. It's a big question in the sphere of ethics and metaphysics. Everyone deals with that question as they wish and every choice is respectable. Just the way people love and are open-minded is important ! The first step to thinking for itself. the human mind will forever be superior to such machines. AI of the future will defy our old-fashioned expectations. Water striders collected from streams and ponds in Seoul, South Korea, with bodies a half-inch (1.3 centimeters) long can jump more than 3 inches (8 cm) high on average. strider - a person who walks rapidly with long steps; "he was such a strider that she couldn't keep up without running"
HOW CLOSE ARE WE TO COMPUTERS THAT THINK LIKE HUMANS? : Computers can do a lot, but when will they be able to think like humans? Computers can do a lot, but when will they be able to think like humans? Carl Gustave Yung a écrit: According to Jung the human mind has innate characteristics “imprinted” on it as a result of evolution. These universal predispositions stem from our ancestral past. Fear of the dark, or of snakes and spiders might be examples and it is interesting that this idea has recently been revived in the theory of prepared conditioning. However more important than isolated tendencies are those aspects of the collective unconscious that have developed into separate sub-systems of the personality. Jung called these ancestral memories and images archetypes. A robot has nothing to do with evolution, no collective unconscious, no ancestral memories and images archetypes. How can it think like a human being ? Gérard, I was not at all annoyed and listened carefully to the video. As I am rooted in my belief in the eternity of the spiritul aspect of matter, i am doubtful about that. I am not sure whatsoever that I am right and last week my friend from Alsace tried to convince me that I was wrong. Anyway I like positive beliefs and that creed is important for me. why not ? Ever wonder why insects are so organized and cooperative? A team of roboticists have managed to emulate the cooperation strategy of leafcutter ants with computer simulations. The result could shed light on how cooperation evolved in animals. There it goes, in search of victims. Under the Doctrine of Doctivity, health care has evolved from care and compassion to the surgical sterility of a business model. I don't think we have to worry anytime soon about computers waking up and becoming conscious, but in terms of specialized applications, they're getting pretty remarkable. I have just read that very interesting article which says that robots can automate certain routine tasks but won't become conscious as humans are. Sharp Will Sell This Mini Robot as a Smartphone. Would You Use It? "Dude, your robot's ringing. Gonna answer it?" Now that robots are there, the work of men is challenged. According to several experts, we have to rethink our organization to work with the machines. Contrary to popular belief, it should remain a place for everyone in skilled jobs like those who are less so! Robots are good at precise, complex activities not only doing hard tasks for humans, like welding a car or grass strimming, but with the host of sensors recognize objects, move throught a home. Fortunately robots are useful but not good at everything ! Human beings have a bright future haven't they ? "Now we can really start talking about 'power plants' -- we can place sensors in plants and use the energy formed in the chlorophyll, produce green antennas or produce new materials." A team of researchers has created living rose plants with electronic circuits threaded through their veins. Robots ! thank God ! They look so human ! The future is on display today in Japan, where retail workers will work alongside a talking humanoid robot to welcome customers at a major department store.The future is on display today in Japan, where retail rworkers will work alongside a talking humanoid robot to welcome customers at a major department store. 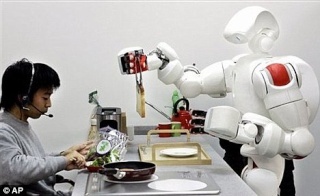 Engineers in most of the world try to make robots perform specific and unpleasant tasks. i understand that perfectly but why are japonese enginneers obsessed with making the robots look more human ? It's so complicated. Getting robots to understand real-life human speech may be the hardest job of all and that's the reason why japonese scientists are trying to give robots means other than language to understand people. For instance understanding the variety of gestures and signs people use with language is very helpful but what for? is robot relationship like human relationship? isn't it rather fake relationship ? disappointing relationship ?